Alfalfa is native to Asia and is one of the most important and commonly planted hay crops in the world. 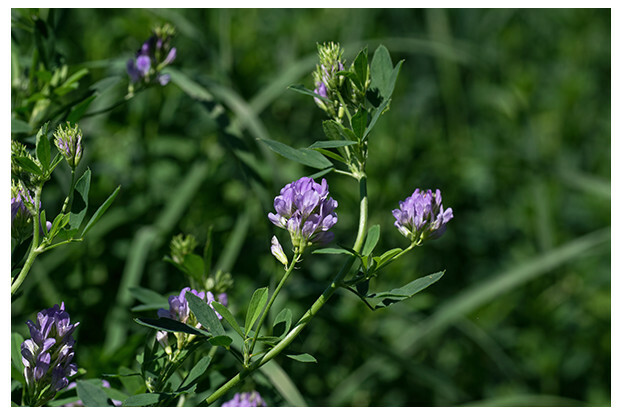 A long-lived perennial legume, alfalfa can grow up to three feet tall and produces clusters of purple flowers. It prefers deep, well-drained soils and is found throughout the entire United States. It’s generally grown for hay where it can be harvested several times a season. Alfalfa can also be partnered with grasses for pasture grazing, although it should be a small percentage of the overall forage content to avoid bloating.